Our Silent Auction will feature this Signature Piece by local Artist Gary Traczyk. 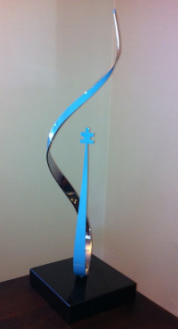 Sculpture is valued at $2,400. 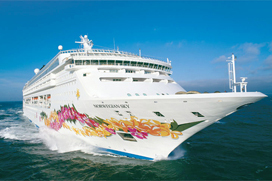 Buy a Raffle Ticket and enter your chance to win a three or four day cruise on NCL's Norwegian Sky. with Disney Park DM day Tickets. 2 Certificates to the Seatrek Reef Encounter at the Miami Seaquarium. Roberto Carlos Concert, June 2 at the Miami Arena. Autographed Baseballs by the following players from the Philadelphia "Phillies"
4 tickets to a Miami Heat game with Limo ride to the AA arena. Carlos Boozer autographed college jersey and bobblehead doll. Andre Agassi, Muhammad Ali, Lance Armstrong, Warrick Dunn, Jeff Gordon, Mia Hamm, Tony Hawk,Andrea Jaeger, Jackie Joyner-Kersee, Mario Lemieux, Alonzo Mourning and Cal Ripken, Jr.
$70.00 gift certificate to The Improv Comedy Club and Dinner Theater. $50.00 Gift Card to New York New York Restaurant.